This blog is a continuation on the different aspects of digital innovation including another SAP Partner interview. Many statements in these two interviews (also see blog post from March 27th) about innovation seem alike and confirm my personal observations: An ideal workforce should have passion – not only for technology – to nurture creativity. 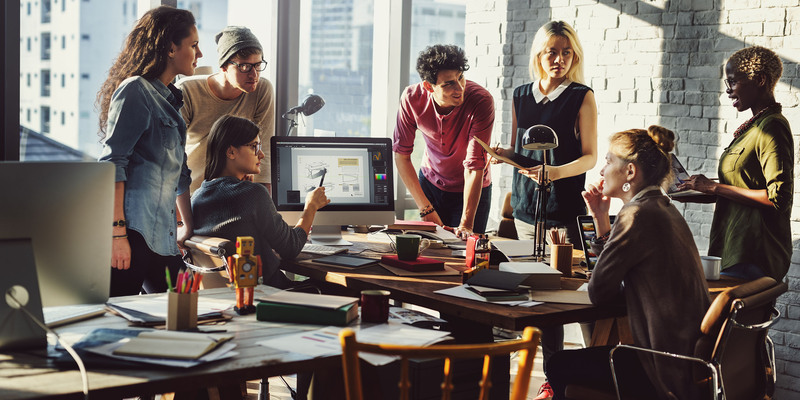 There are certain conditions, which enhance new ideas, such as diverse teams, a certain work environment and a work culture that allows free thinking. Many tasks can and will be taken over by machines in the future, however emotion and creativity are something exclusively human. Last but not least, innovation is a process, which can be supported by tools and technology. Timo Simon is the Director of Products, Innovation and Business Development at maihiro, a German owner operated software company, which has successfully expanded globally thanks to their expertise in existing business areas, but also due to the move into innovation and new technologies. The latest innovation Timo Simon has been driving, is a smart scanner for business cards. Maybe in the future, everybody attending a business event will have a QR code on their suits, providing personal data as well as other information. Until then, maihiro’s maiCatch App is a proof of the creative link between smartphone capacities (in particular, the camera) and new technologies such as image recognition with back-end systems such as the SAP Hybris Cloud CRM. In any case, it is a great example for the symbiosis of the analogue and the digital world. What keeps you up at night? Is it new product ideas; the question which technology you should invest in; thoughts about which investors to find for your innovations or how to convince new customers about a new product innovation? Timo: I usually sleep well at night, but when I investigate and talk to people, all these questions are relevant. It is more a matter of attitude, of being open and inhaling anything around: everything could possibly match into a new idea. How much time does it take to overcome a critical margin, where success is a question of profit and not only likes of the story talking about the idea (only a few YouTube stars can live of likes and thumbs-up – the rest is real business and true added-value)? Timo: The base of any new product (just like the fundament of a house) is of major importance for success, therefore we spend dedicated time to check different perspectives and look for different opinions – diversity in teams and reviews with external stakeholders are crucial! I try to pursue ideas with a minimum viable product (MVP), which already convinced a small number of customers or co-sponsors. Having a technology with services like those provided by SAP Cloud Platform, you can shape a minimum viable product very easily, create mock-ups and test functionality at an early stage. All this helps to keep innovation time low and launch a new product in up to six months to the market. How does your company stay at the edge of all the options that technology allows? Timo: Innovation isn’t something that comes by pressing a button – the right combination of people who share a passion for innovation, technology and emotion is one important piece of the puzzle, if innovation is the goal. Just like artists or writers who make their living with creativity tend to work in a certain environment, we look for an ambiance which fosters creativity : For instance, at a so-called “Think Tank” event on the island of Mallorca, where new ideas, motivation and prototypes come with the sun, good vine and the Mediterranean air. Still, the focus of these workshops is very outcome oriented. What is your belief and your personal handling, when it comes to using and implementing digital appliances in your life? Do you have your scales connected to an app that shows you the monthly changes in your body weight and gives you an automated warning if your BMI is over a certain threshold (I doubt it, since you are in excellent physical shape)? Timo: I enjoy using simple apps that deliver as much value as you can get – and I look for analogue options to get balance and inspiration. In my spare time I love to watch people in a particular situation to get inspired. Besides, having a digital break and realizing the importance of life without digital gadgets is also important to get new energy for my daily work. Thank you, Timo, for your time and insights. Ulrike Fempel is a book author and a senior business development manager with over 20 years of global experience in IT. Recognized as significant driver by peers, management as well as partners, she has a passion for sciences. SAP Cloud Platform general product and pricing information for partners and customers. Blog post by Bjoern Goerke, CTO at SAP and President of SAP Cloud Platform on the SAP Cloud Platform. SAP App Center: the SAP digital marketplace where customers can buy solutions directly from SAP partners.